Crystal Point made from Genuine and Natural Brazilian Amethyst Gemstone and may have natural specks and internal inclusions. Comes with Silver Electroplated Setting and Holds Faceted Citrine. 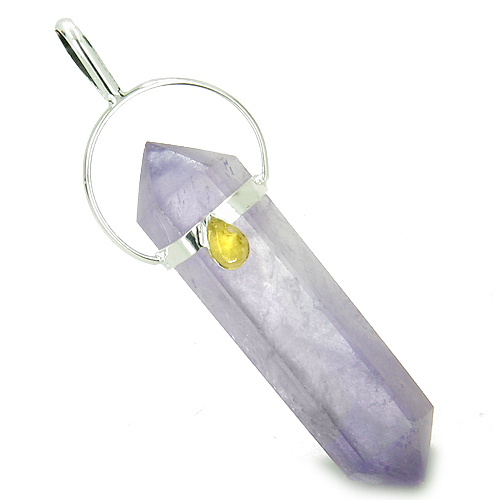 This is Naturally Unique and One of the Kind Crystal Point pendant made from Amethyst Gemstone. This Crystal point is made from Genuine Gemstone and may have natural specks. Has Silver Electroplated Setting and Holds Faceted Citrine. It is Heavily Electroplated in Silver and looks absolutely Gorgeous. These Crystals are Handcrafted from Brazilian Gemstones and made exclusively for Best Amulets. This Crystal is Safety and Travel Protection Amulet, as it is made from Amethyst Gemstone and attracts powers of Protection while you Travel.